For those of you who don’t know, the gentleman pictured above is an icon in the advertising industry. His writings are studied by many up and coming advertising/marketing people and by copywriters. Ogilvy has helped to build some of the most recognizable brands in the world, such as Rolls Royce, American Express, Sears, Ford, Shell, Barbie, Pond’s and Dove. One of the lesser known facts about David Ogilvy is his passion for market research. In fact he started out as a market researcher. Gilleard Dental Marketing has a strong tradition of market research and has helped corporations improve their branding and sales through its use. We use market research in all our marketing projects for dentists. How can market research help you? Well, rather than reinvent the wheel, let’s let Mr. Ogilvy tell you himself, direct from the horse’s mouth! From Greek strategia, function of a general. It’s no coincidence that marketing campaigns are called “campaigns.” Like a battle, a marketing campaign needs to be strategized and implemented based on a plan. The most successful strategies have gathered intelligence ahead of time and their steps carefully planned. We can help our clients strategize their marketing for best success. 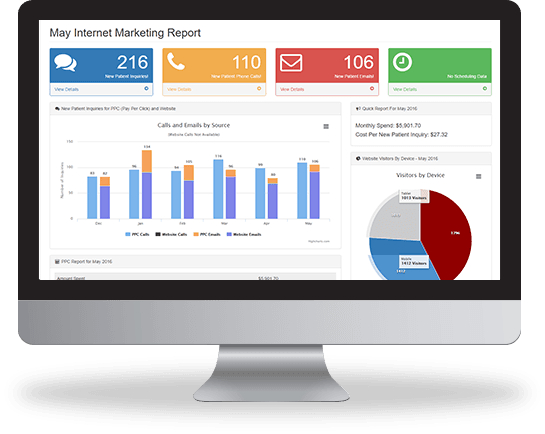 We track all our marketing meticulously, using call tracking and sophisticated analytic software to chart your marketing results. We use this information to constantly enhance our efforts and increase your returns. Gilleard Marketing’s programs through direct mail and Internet marketing solutions have consistently proven to provide high returns in investment. And, despite the high-quality of our implant marketing solutions, we have priced our marketing to fit comfortably into monthly budgets. To make an appointment for your free consultation, call 855‑486‑2410 or click here to request an appointment online.